This 65-incher is a part of Sony’s X810C series, and it packs some truly amazing features. At the very beginning, we can confidently say that this TV is designed for entertainment. However, it would also be good to mention that it is lacking 3D technology so if you are one of those customers who require a TV with 3D technology, then this one probably is not for you. Still, besides the lack of 3D performance, there actually isn’t anything bad to say about this TV. It offers some truly great things, and will provide its users with incredible viewing experience as well as loads of fun thanks to its amazing smart capabilities. It provides 4 times more clarity than HD and even 4K streaming is improved to maximize picture quality. This Android TV comes with voice search, Google Cast, as well as a huge collection of content, games, and applications from Google Play. Here is what makes the Sony XBR65X810C so great. Amazing picture engine called 4K X-Reality Pro engine is behind the amazing picture performance that this TV offers. Not just that, but it is also supported by X1 engine, a brand new 4K processor which was introduced in 2017 and designed for enhancing the overall 4K picture quality produced by Sony’s 4K lineup including this particular model. The overall 4K picture quality is improved in many ways, such as its color, contrast, clarity, and detail. Even though this model doesn’t boast TriLuminos Display like some other models of Sony 4K lineups, it is supported by great precision color mapping technology. It is true that the TriLuminos Display creates better color performance, but the color performance of this model is still more than great. This TV is also powered by Dynamic Contrast Enhancer and Frame Dimming technology for improving the contrast by creating a strong contrast with brighter white area and true black level. The technology behind the amazing motion clarity of the Sony XBR65X810C is called the Motionflow XR960. It allows you to see those sequences with lifelike clarity. The motion blur which usually appears while you are watching fast movies or sports is almost unnoticeable on this TV’s screen. And, of course, this great performance in motion clarity means the TV is also great for playing video games. 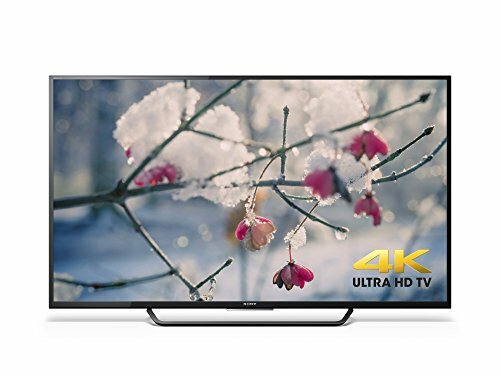 For those who are looking for the best 4K streaming experience, this TV is specifically designed to recognize as well as to improve 4K streaming video. Ultra HD streaming services such as Amazon and Netflix offer extended libraries of original TV series and movies in 4K Ultra HD. Moreover, all the game lovers will be thrilled by the possibility of streaming PS3 games directly to this TV. You can stream and play some PlayStation 3 games the same way you stream movies and TV shows. By connecting a DUALSHOCK 4 controller to the TV you’ll be able to choose from an array of game rental periods. You can watch anything in 4K with this amazing TV because it upscales all of your existing movies, HD sports, and TV shows to super clear 4K quality thanks to Sony’s advanced 4K X-Reality PRO upscaling. Android TV is so much more than simply a Smart TV. This one delivers streaming apps, Android games, and great content to your TV. It also boasts personalized recommendations and voice search so that your smart experience is truly enhanced. Moreover, since the Google Cast is built-in, you are now able to cast your favorite entertainment such as MLB.tv, Showtime Anytime, HBO GO, and much more from your personal device to the Sony XBR65X810C’s big screen. It allows you to cast from your iPhone, iPad, Android phone, Windows laptop or Mac or Chromebook. Not only that, but you can personalize this TV as personalized recommendations from YouTube, Google Play, and supported applications will appear automatically in your home screen.